(Medical Xpress)—Yuet Wai Kan of the University of California, San Francisco and colleagues have created HIV-resistant white blood cells by editing the genomes of induced pluripotent stem cells. The researchers inserted genes with a mutation that confers resistance to HIV into stem cells. White blood cells grown from these stem cells were HIV resistant. The research appears in the Proceedings of the National Academy of Sciences. The HIV virus attacks CD+4 T cells, a type of white blood cell, by locking onto a protein called CCR5. A small number of people of European descent have a mutation in the gene that codes for CCR5. HIV infection progresses more slowly in people with one copy of this mutation, known as CCR5Δ32, than in people without the mutation. Those who are homozygous for CCR5Δ32 are resistant to HIV infection. Inserting genes with the CCR5Δ32 mutation into cells of people suffering from HIV infection could cure them of the virus. Previously, scientists tried doing this by transplanting stem cells from people with natural HIV resistance into people with HIV. In a well known case, Timothy Ray Brown, an HIV patient, received stem cells from the bone marrow of someone with the mutation. After the procedure, signs of HIV infection disappeared. Unfortunately, because so few people naturally carry the CCR5Δ32 mutation, finding enough donors to treat all HIV patients would virtually be impossible. It would be better if scientists could create the mutation in people with the infection. Researchers have tried disrupting normal copies of the gene that codes for CCR5, so the virus could not latch on to the protein. However, this might not be a good idea, as completely destroying the gene could have an unknown harmful effect. Kan and his team thought a preferable solution would be to recreate the CCR5Δ32 mutation in pluripotent stem cells. People with this mutation usually are healthy, so the team didn't think this would cause any problems. They generated stem cells homozygous for CCR5Δ32, using a new method of genome editing that relies on the CRISPR-Cas9 system, a bacterial immune system that works by splicing DNA from invading viruses into the bacteria's own DNA. White blood cells derived from the stem cells were HIV resistant. These white blood cells were not CD+4 T-cells. However, previous attempts to modify the CCR5 gene in CD+4 T cells of HIV-infected patients, using an older genome editing method, show that patients receiving this treatment would require repeated T-cell transplants. 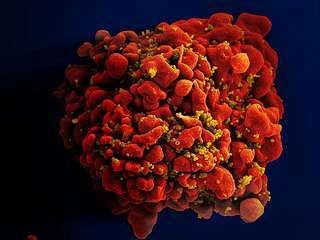 The researchers suggest creating HIV resistant stem cells, which would later develop into all kinds of blood cells. Individuals homozygous for the C-C chemokine receptor type 5 gene with 32-bp deletions (CCR5Δ32) are resistant to HIV-1 infection. In this study, we generated induced pluripotent stem cells (iPSCs) homozygous for the naturally occurring CCR5Δ32 mutation through genome editing of wild-type iPSCs using a combination of transcription activator-like effector nucleases (TALENs) or RNA-guided clustered regularly interspaced short palindromic repeats (CRISPR)-Cas9 together with the piggyBac technology. Remarkably, TALENs or CRISPR-Cas9–mediated double-strand DNA breaks resulted in up to 100% targeting of the colonies on one allele of which biallelic targeting occurred at an average of 14% with TALENs and 33% with CRISPR. Excision of the piggyBac using transposase seamlessly reproduced exactly the naturally occurring CCR5Δ32 mutation without detectable exogenous sequences. We differentiated these modified iPSCs into monocytes/macrophages and demonstrated their resistance to HIV-1 challenge. We propose that this strategy may provide an approach toward a functional cure of HIV-1 infection. Sounds like these folks are flirting with the Nobell Prize. Inasmuch as some have inferred an off world source for this virus and some have even gone so far as to call its cure our 'final exam' as earning our respect and membership in the community of spacefaring sentients, we may by the application of this consider ourselves accepted.